Last week, I finally replenished my Almond Butter stash after being without it for a few months. I really don’t know how I survived that long! I actually need to start making my own again too. But the good news is, Almond Butter (crunchy, all-natural) is now back in my life and I can return to a normal human being. Well, I guess that’s relative. 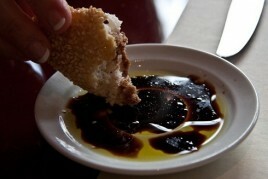 Anyways, I am willing to turn a new leaf in 2011 where I shall not be without my dear Almond Butter for this long. This is a promise to myself. It was a tall order, but I was willing to take the challenge! Amazingly, I was satisfied with the first trial. That rarely happens! It must be the magic of the Almond Butter. These Almond Butter Chews could not be any easier and they make a simple pre-workout snack for about 100 calories each. They take 5 minutes to whip up, use just 1 bowl, and do not require an oven! You could even make them gluten-free quite easily too. 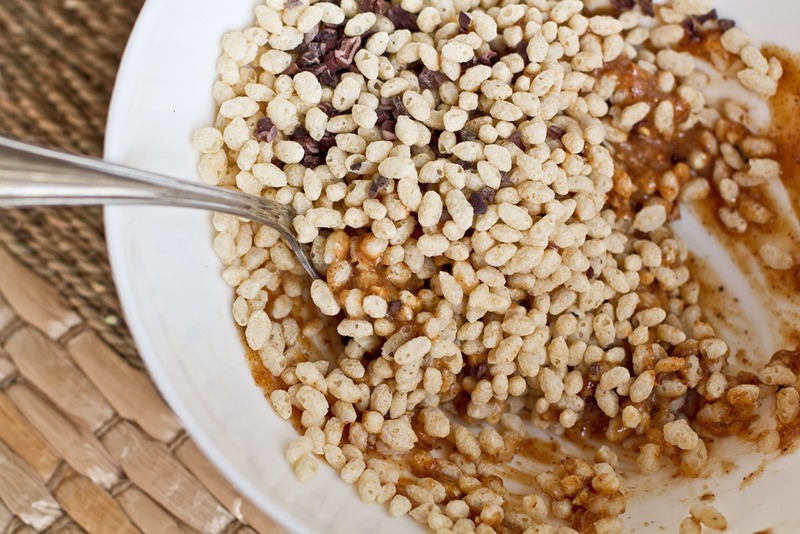 I use the Nature’s Path Rice Crisp cereal that just happens to also be Gluten-Free. Directions: Line a plate with parchment paper. In a medium sized bowl, stir together the almond butter, brown rice syrup, and vanilla. Microwave on high for 35-45 seconds. 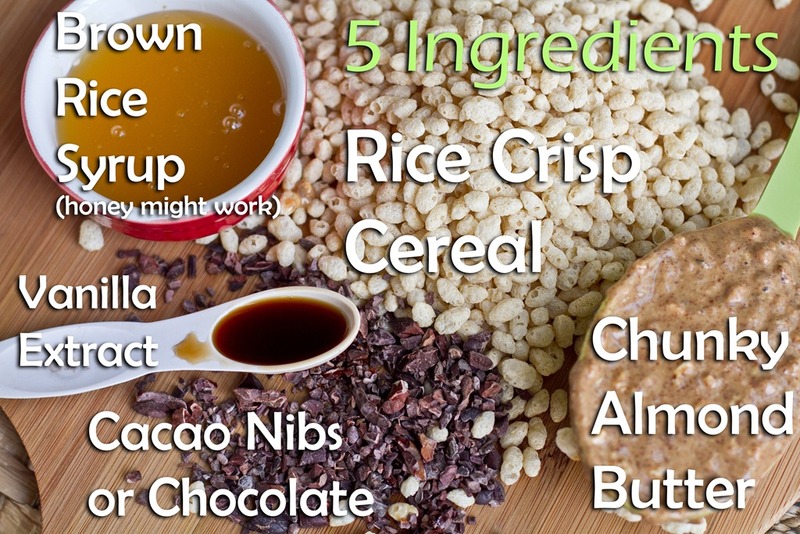 Stir well and immediately add in the rice crisp cereal and cacao nibs (or chopped chocolate). Stir very well until fully mixed. Wet hands thoroughly and shape the mixture into ‘golf-balls’. Press mixture together firmly so it will hold. Wet hands after each ball is formed so the mixture will not stick to your hands. Place the balls onto parchment paper and freeze for 5 minutes. You can keep these chews in the freezer in a sealed container. I really enjoy them straight from the freezer. They remain nice and chewy. Makes 7 golf-ball sized chews. For nut-free option, use sweetened sunflower seed butter. I have been using this Nature’s Path Rice Crisp for a few years now and it never lets me down! It also happens to be Gluten-Free to boot. I’m always asked where to find Brown Rice Syrup. You can find it at Whole Foods and at Loblaws/Superstore in the natural food aisle near the honey. I use Lundberg’s organic Brown Rice Syrup. Brown Rice Syrup is made from brown rice and is thus a great alternative to refined sugar because it has a lower glycemic index and it also does not produce spikes in blood sugar like simple sugar. As a result, brown rice syrup delivers a steady and consistent energy supply. I fueled a half marathon using brown rice syrup once! Heat in microwave on high for 35-45 seconds. Stir. Make sure to stir very well so that you coat all of the rice crispies! Now wet your hands very well and form into balls. You will have to keep wetting your hands after you make each ball so the mixture won’t stick. I made 7 large chews. Eric and I absolutely went wild over these Almond Butter Chews. I love them straight from the freezer. They are chewy, sweet (but not too sweet! ), crunchy, and they pack a wonderful Almond Butter Flavour. It is a great pre-workout snack when you just need something small and you don’t need a large snack or meal. 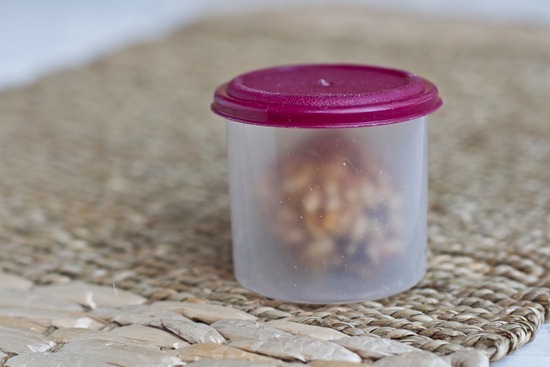 I popped one in my bag and enjoyed it before a Body Pump class and it was just enough fuel to carry me through until I had a post-workout snack. You might also be interested in my Chocolate PB Chew recipe too! I love almond butter too! These look fantastic. 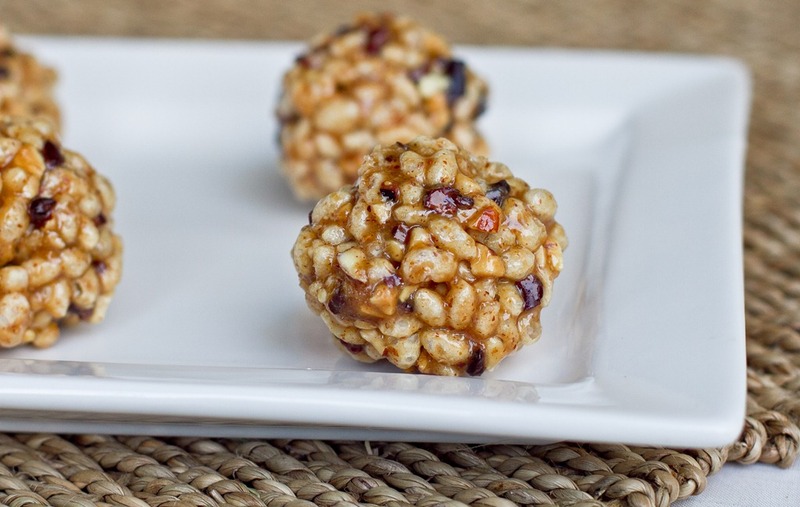 These sound perfect for a morning snack or a pre-workout pick-me up! I’ll have to make these ASAP! These look delicious! I can’t live without almond butter either and make a new batch about every two weeks (together with peanut and hazelnut butter haha, nutbutters go very fast between me and the boyfriend!). Delicious!!! I would what I can replace the rice crisp cereal with to make it grain free. I have an intolerance to grains. Any ideas??? Those look amazing! These look great. I’m going to try these at home! :) And hooray for being quick. I have this almond butter in the fridge that I’ve yet to use… I think it’s raw almond butter. Does that work the exact same way? OH YES I remember Little Debbie Nutty Bars! They were my fav – especially right out the freezer. If these balls taste anything like a Little Debbie, I’m sold! Those look fantastic Angela! I love Nature’s Path rice puff by the way! 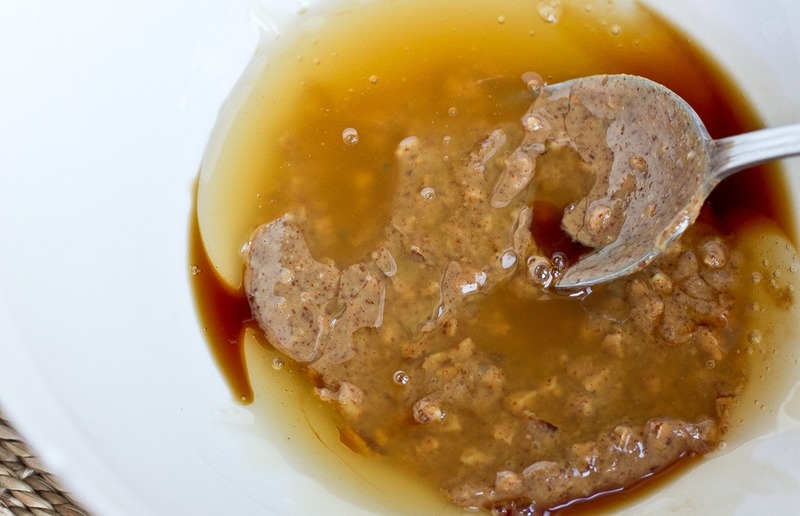 I love this recipe–and I really appreciate the explanation of brown rice syrup. I’ve been wondering how that might be better than maple syrup or honey–so thanks! Those do look perfect! Very simple snack. I have almond butter in my fridge, I use it to flavour soups sometimes. 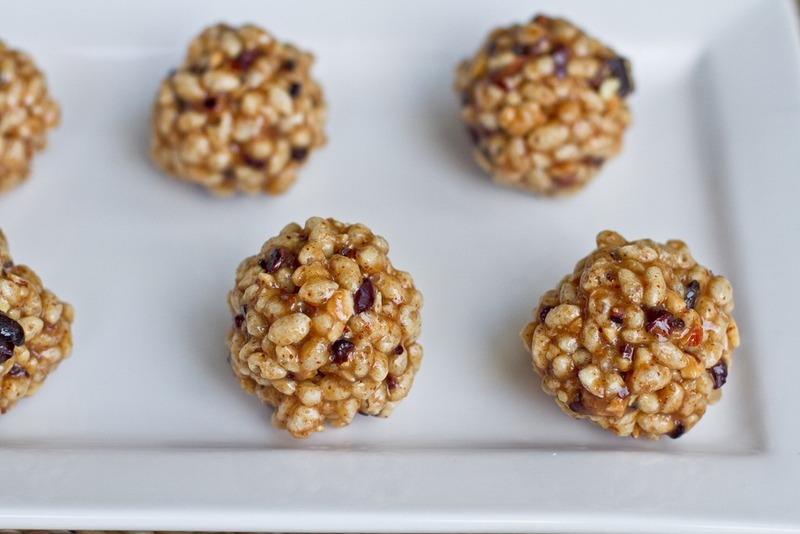 I made a similar recipe to these a while back but used peanut butter and puffed millet. I can’t wait to try them w the almond butter, so yummy! I’ve got everything but the cereal at home, but I do have puffed millet! YAY! I’m going to try! haha…I know same here. I used to BEG my mom to buy little debbie snack cakes! They dont taste just like them or anything, but the texture and taste def. reminded me of them. Im sure that would be even more so, if I had used PB + chocolate too. Awesome! Thanks for the recipe!!!! P.S. I used honey in mine a while back and they held together perfectly, I think it’s the nut butter that acts as a ‘glue’, so agave would work I’m guessing also. Those are cute. It looks like the perfect snack. These look SUPER tasty. These will go on my post-January bake list for sure (I promised my boyfriend that January is a no-baking zone to recover from Christmas)! Those look fantastic! Now I just need to find me some brown rice syrup..
OMG! These are so cute! If only I had the time to keep up with all of the interesting recipes you post. Oh well, in another life! Nutty Bars were my favorite growing up! 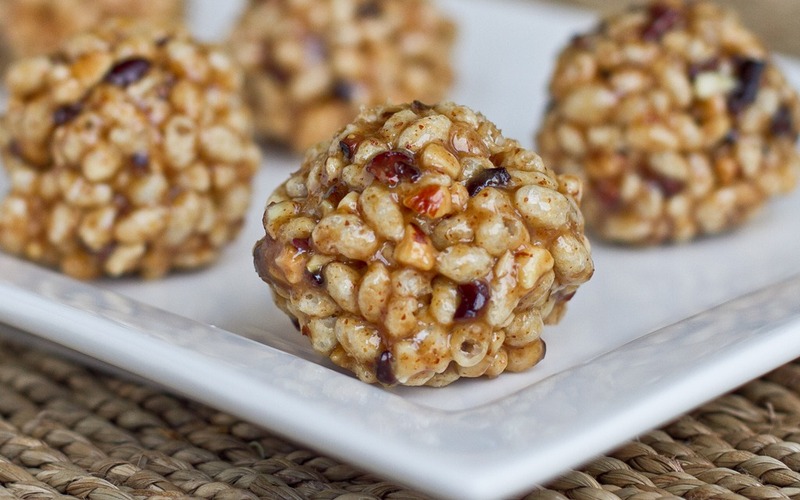 I’ll defintiely try these out, but using agave since that’s what I keep in my pantry. this is so funny that you posted these! i just made no bake granola bars the other day and theres one left (hmm howd that happen? anyway..) so i was looking at the empty glass container that they were in and was like hmm i need to make something quick and similar! 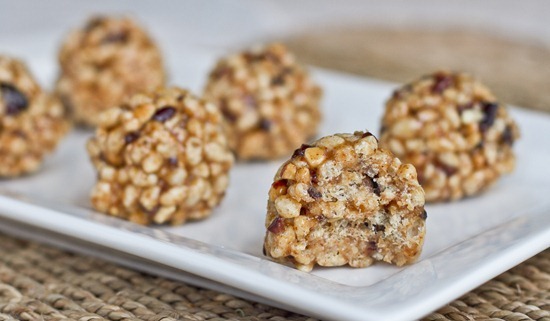 so i think I’ll be making these :) i used puffed millet in my bars and i’ll probably do it for these, its so delicious! Hahaha, oh no! I was just giving up my almond butter for awhile too. It’s an expensive addiction when you go through a jar in about 2 days. I’ll have to try this! 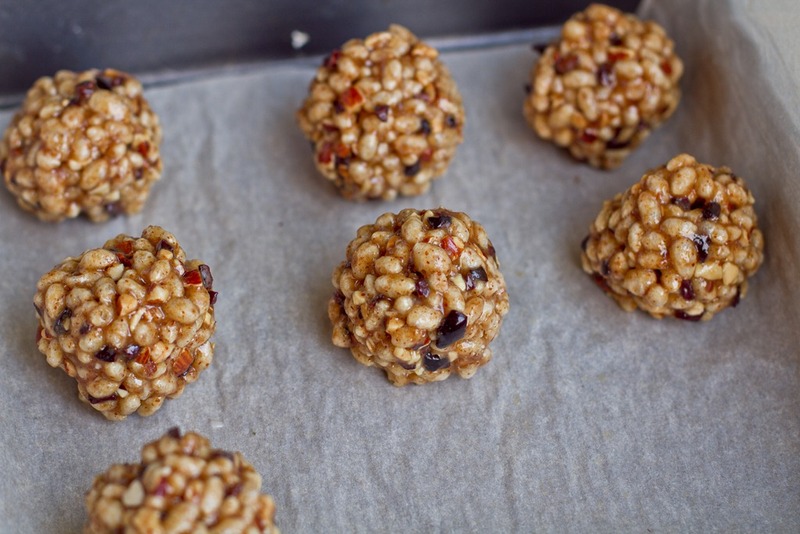 I can’t wait to try these… I’ll have to try some substitutions for the brown rice syrup! These look delicious! I bet they wouldn’t last two minutes in my house. Do you think rough choped nuts would work instead of the puffed rice? I LOVE that they are Gluten-Free- yay! I’m excited to try them and give them to my husband and 11-month old- neither of whom can have gluten. When I was pregnant last year I used to crave Little Debbie’s nutter butter bars like crazy!! These look SO good!! I’ve been severely lacking in the snacks dept. at home lately. I may need to make these tonight. These look great! I am always looking for recipes for home-made school snacks, and these would be perfect except that we’re not allowed to use nut products. Makes it a challenge! I usually manage to get around this by replacing nuts with seeds in baking. Do you think tahini or pea butter would work in this recipe? Pea butter is sweetened, so I imagine you might be able to reduce the amount of brown rice syrup? These look great!! I’m afraid to try them, though, because I’ll probably eat them all in one sitting! Do the cacao nibs melt at all? Ahh these looks amazing! You seriously need to get a cookbook. If you ever do a cookbook please incorporate step-by-step (ooo baby…NKOTB ;) ) photo instructions because it helps us beginner bakers learn! Your husband is a lucky man, he must love being the guinea pig for taste testing! Wow, if I can make my husband a healthy version of Nutty Bars, I will be quite a hero! Thanks so much! How did you go so long without almond butter??? I have all the ingredients at home, can’t wait to try these tonight! I have made something very similar to these with honey and it does stick together fine. Very yummy! Thanks for the recipe—I can’t wait to try! how did you like the class?! any pointers for my first time tonight? I used to do Body Pump for a few years back in university and I loved it (or loved to hate it???) My best tip is to start off with VERY low weights….even with low weights you will still be sore the next day. Have fun! I LOVE the Nature’s Path crispy rice and have made rice crispy squares with it before – so tasty! These look so cute, and now I have a huge craving for almond butter! oh my, this is crazy, but i made the exact same recipe! my picture isn’t as beautiful as your photography, but mine is here!! http://juniakk.blogspot.com/2010/09/snap-crackle-pop.html – i might try to decrease my brown syrup in mine next time, so it won’t as sticky! i love keeping them in the freezer to eat as a dessert :D.
heeh that’s funny…great minds think alike! agreed! thanks for all of your posts. you inspire me to make yummy food and blog more! I wonder what would happen if I added some vegan marshmallows into the mix…..oh dear. I’ll tell you what happens…awesomeness. I made these in literally 5 minutes and I cut 1 T of rice syrup, added a handfull of dandies marshmallows along with a bit of flax meal and maca powder. I also used puffed millet because that is what I had, but I think they would be even better with puffed rice. Either way they were great, I ate one as I headed out the door for a short run and it was fantastic. i’m not very good in the kitchen, but i think even i could handle this recipe! i can’t wait to make these! thanks angela. I just wanted to let you know that I asked for your glo bars for x mas, got them, and they have been my savior when I’m running between classes with an empty tummy. THANKS!! I got Endure and Classic, but now I NEED to try the others. Good thing, now I know what to ask for for my bday! it’s like the most perfect bite that’s ever been created! love this…and i love that you could adapt to different nut butters too! They look really good, but most importaly they look easy! as much as I love baking……I love your no bake recipes!!! These look delicious, I am going to make them today. Will you move in with me for the remainder of the year? Seriously, these look amazing. Those are cute!! They appear to hold together really well too, which is good! Thank you for yet another FABULOUS recipe! i love how quick and simple these are…oh and the fact i can use chocolate chips in them! 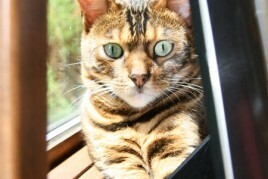 perrrrfffeecccttt! Holy smokes, these look amazing! I need to surprise hubby with these in his lunch on day. Thanks! These look so good!! I am not a fan of almond butter, but I bet they’d be great with sunflower seed butter. YUM this looks like the perfect 2:00pm pick-me-up snack at the office. I don’t have brown rice syrup though…how do you think agave would hold up?? Great. I’ll let you know how it goes! These are so cute!! Snack success! These look delicious and SO easy!! I have a box of brown rice cereal in the pantry I’ve been trying to get rid of…looks like the perfect recipe!! Ohhh, these remind me of those Little Debbie Star Crunch cookie things…I don’t even know how to describe them. These look 250% better!! These look awesome! Once I buy some brown rice syrup, I think I will double or triple this recipe! I’m always looking for easy, quick snacks to make myself. yum!! so excited to try making these!
. . . and thanks so much for including the nutritional info, that’s awesome! Those truly look out of this world delicious! All I need is the rice crisp cereal (and I think I might try adding some cinnamon as well :) ). Do you think maple syrup would work? Or does the brown rice syrup have better ‘binding’ consistency? BRS has a much better binding consistency than maple syrup, so Im not sure if it would hold together or not. Let me know if you do try it! ooo, these look great! I hardly ever buy cereal, but may have to for these, yum. I really like using brown rice syrup, but each time I have a hell of a time opening the jar again, does this happen to you? I buy brown rice syrup by the pail for the bakery…hehe…but I think that used to happen to me with jars! These almond butter chews make me think of rice krispies squares. Only better. Thanks so much for sharing such a lovely recipe. I will try these as soon as I procure rice crisp cereal and brown rice syrup (or I can try honey and let you know how it works). Great idea! P.S. I LOVED Nutty Bars! If these taste anything like nutter butters I’m on in!! I’m pretty much shocked you went that long without it!! me too…there is no excuse! Happy little balls of goodness. They are so cute! those look so wonderful!!! I can’t wait to make them! I’ve bookmarked this and added brown rice syrup to my next shopping list. Thanks for this Angela!!! Just whipped these up in 10 minutes flat! I used organic PB, honey, and mini choc. chips, and had to use about 1.5 cups rice crispies but they turned out GREAT! I love it when you post simple recipes- thanks! 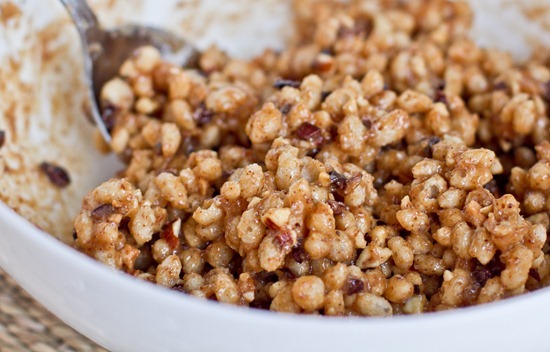 I made a VERY similar recipe the other day with cashews and steel cut oats – yum! Oohhh those looks so yummy. I love the texture of the rice cereal! 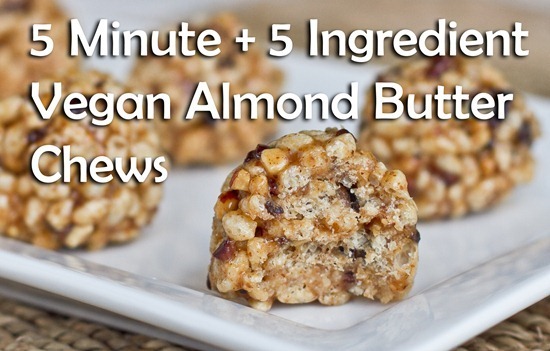 I am a huge fan of 5 or less ingredients, no bake, vegan, GF, portable, and easy…and you hit the nail on the head! is brown rice syrup easy to find? well my mom would prob know where to get those :) shall try to make those soon. great to see a recipe with rice sirup! Sooo good! I went straight to Whole Foods after the gym to pick up the ingredients I didnt have on hand. I wasn’t able to find rice cereal but puffed wheat worked just as well. I’ll keep an eye out so I can try it both ways! I absolutely LOVE your blog and tend to check it a few times a day :) Keep up the great work!! Made these last night – sooo good! Love that recipe only made 6-8, as this kept me from eating them all at once! I made these this morning using honey and they came out great. 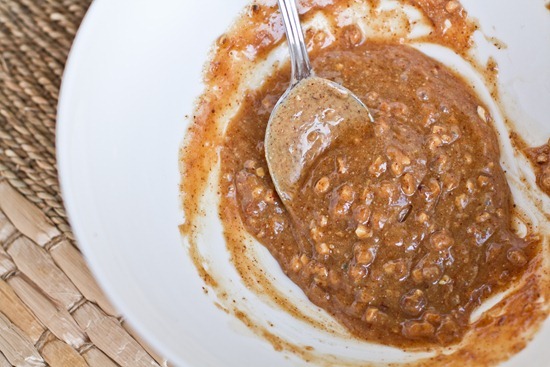 I could have just eaten the almond butter, vanilla and honey mixture straight from the bowl…very yummy! I love this!!! A 5 minute snack is right up my alley. Love almond butter! I make a similar treat but with maple syrup. I still need to get my hands on some brown rice syrup. Your snacks looks so yummy! I’m making these this afternoon! And I think I’ll make the broccoli dal this weekend — keep the recipes coming!! Amaz-balls! Delish! You Are the Best! Just made them with raw honey and after about 5 mins they r still on the soft side but I’m giving them more time! They taste really great! 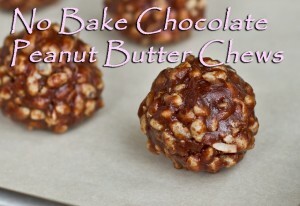 I made these today with chunky natural PB and chocolate chips–sooo good! I always forget about brown rice syrup but I definitely want to start using it more often! Almond butter IS magic! I have it just about every morning for breakfast….. on waffles. Its my happy breakfast. These are great– I had some peanut butter and molasses available. It changed the flavor profile, but they were tasty, light and perfect. I’ve been needing a ‘small bite’ on my morning commute before I have my real breakfast, and these have been perfect. So easy. Great job! Love these! I used creamy AB and they still came out delicious! It was hard to eat just one! Can’t wait to try them pre-workout this week! They are the perfect after dinner treat. Angela, is storing these in the freezer a must? Or do you think they would hold up ok in the fridge? i made these today for the first time- YUM!! i didn’t put chocolate (not much of a chocolate kind of person), and didn’t have any brown rice syrup.. i used 3 tbsp of vanilla agave, and it turned out PERFECTLY! tastes exactly like the calorie loaded, super sugary, fake ricecrispy treat that i used to eat as a kid.. wrapped up in blue foil. yuck! Great idea but is it OK for diabetics?? made these over the weekend. aweome. These are terrific! I followed the recipe as directed, except I did drizzle some agave over the mixture before my final stir to sweeten a tad more:) I also used a metal cookie scoop intead of my hands which worked perfectly. Thanks for the recipe..I am always looking for something quick and easy that won’t wreck my body!! I made this recipe today and wow, are they ever delicious!! I recently discovered that I can no longer eat chocolate (big bummer) and these were the perfect sweet treat. Thanks for sharing!! I made this the other day and they are fabulous. I ended up only using 1.5 tsps of dark chocolate shavings and that was perfect. Thank you for your fabulous site. 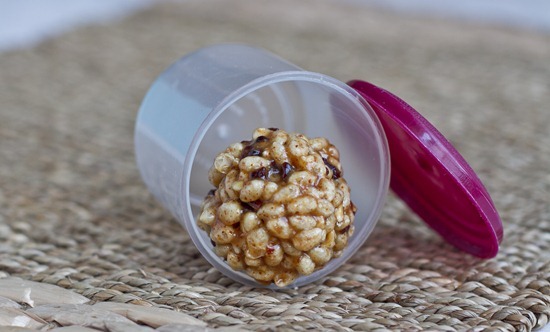 I just made these and they were DELICIOUS, however my man likes the chocolate peanut butter ones best :) Thanks for the information about the rice syrup as well… probably a good alternative for diabetics instead of honey and it tastes delicious! Thanks Angela! I made mine with Millet puffs, Almond butter, honey (it did work!) and even threw in some shredded coconut. So YUM! I was disappointed to hear (on CBC news) that brown rice syrup is high in arsenic…how discouraging is that?! However, made with honey they are still SO GOOD! Also, the Nature’s Path rice crisps are not gluten free, since processing is in a plant that contains wheat. 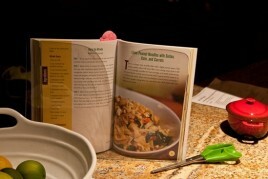 Loving your recipes and eagerly awaiting your cookbook. Hey Margaret, Yes some is high in arsenic, but not all brown rice syrup. It actually depends where it comes from. It’s always best to check with your preferred brand. Lundberg is currently testing their BRS and results should be in within a month or so. 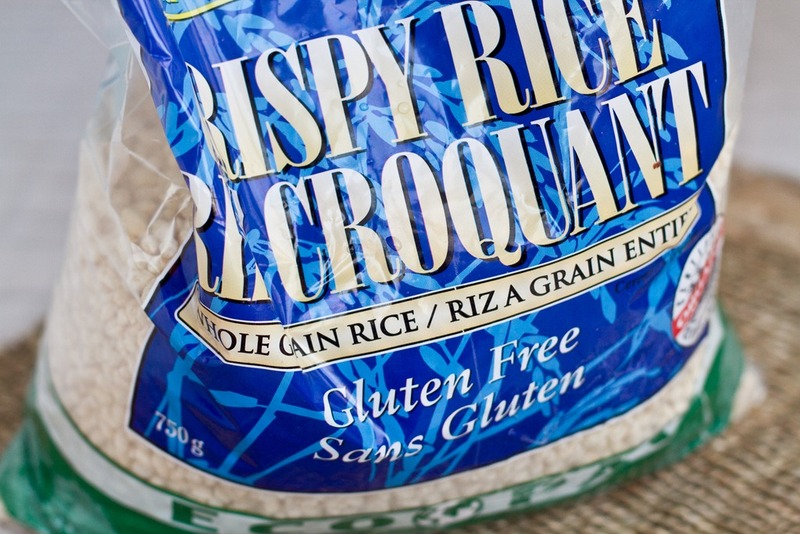 I’m a bit confused about the rice crisps- they say they are certified gluten-free? Don’t they have to pass regulatory inspection for that claim? Didn’t realize that not all brown rice syrup is high in arsenic, good to hear, thanks. I use the Lundberg brand, so will be interested in hearing their test results. 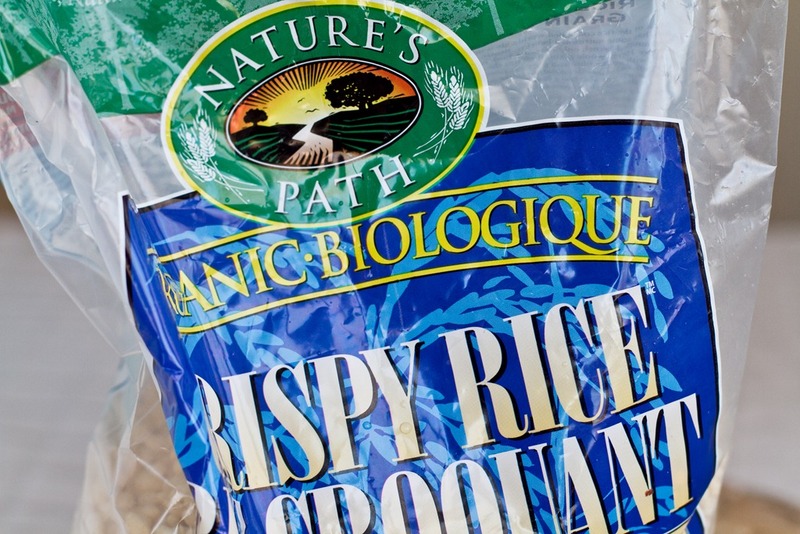 Nature’s Path Organic Rice Puffs are certified organic, but not certified gluten free on the ingredient list (unless there is another Nature’s Path Rice crisp, instead of Rice Puffs that is indeed gluten free). I make these and they last about half a day! I use a little less agave instead of the rice syrup and find it works really well. Excellent idea, thank you! I make these all the time (in addition to your curry bean salad, the frosty oat treat things, and so many more of your wonderful recipes!) They have become household staples in the past year or two. Thanks for really bringing something different into the (and my) world! I Neeeeed to make these today! I just have to make a new batch of almond butter….. I might add a little puffed quinoa that i have here too! Still one of my favorite recipes of yours! I made these yesterday for a quick afternoon treat. I would definitely make them again. I subbed peanut butter, puffed rice cereal, and honey. They turned out great! I love that they’re so simple and yet versatile! My best friend and I are starting our own journey towards veganism right now. 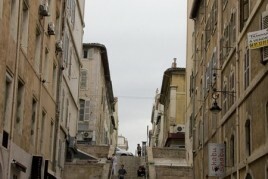 I found your blog a few months ago and, I must say, I absolutely love it! I just made these today and they turn out really well. I’m going to school and living on campus, which also means we have a required meal plan as long as we’re required to live on campus. These are great because they take very little time and I only have to use my dorm’s microwave. Thank you for bringing so many recipes for so many walks of life. It really is quite great. these are great, love your website..but really surprised you would recommend using the microwave! I recently discovered your website, and I just finished making these. SO delicious! My fiancee and I made a pact to only eat one a day because they are so amazing! They are also incredibly easy to make! Thanks for the wonderful recipe! Made these and holy moly batman they are good! I used agave nectar which, in tandem with heating the mix on the stove, made the end result not want to ball. I had a panic moment when I realized this and seriously thought long and hard about just eating the whole pan-full right on the spot to save coming up with a solution. Ha! Used a non-stick mini muffin tin, spooned the mix in, patted it down, and boo-ya, problem solved. :) Thanks for the great recipe. I’ll enjoy these for the next day or two…if they last that long!! We have a road trip this long weekend ! I think I am going to make a batch to take with us!! Can I prepare these without a microwave? I never use one for cooking or baking food….and today I bought the crispy rice cereal….hope it’ll work to melt the ingredients in the first step, in a pan on a stove-top. I tried making these exactly as is but with maple syrup instead of brown rice syrup and it was way too liquid of a mixture. Hi Angela! I have been following your blog for years now and have made a ton of your recipes. This one is absolutely top 3! Just wanted to let you know that I subbed a couple things and it turned out amazing! I subbed the brown rice syrup for 2 Tbsp Honey + 1 Tbsp Agave, the plain rice crisp for Nature’s Path Chocolate Koala Crisp Cereal (basically chocolate rice crisps). Lastly, I subbed the cocao nibs for Ghirardelli mini dark chocolate chips. The mini chocolate chips slightly melted in the warm mixture. Between that and the chocolate rice crisps it was extra chocolatey. Just what I needed. Just threw these together with some organic cheerio-like cereal. AH-mazing! You’re awesome : ) Thanks! I just made these last night for my son as a snack. They are wonderful (for both of us). I typically buy him the Envirokids snack bars and these are very similar, so yay a homemade version! We don’t have brown rice syrup around here so I used honey and it worked great. We also used Envirokids Koala Krisp cereal (gluten free). I used our homemade roasted peanut butter and homemade chocolate roasted almond butter. These were fantastic! These are wonderful! I’ve been sneaking them into the library to help me get through my Masters thesis and they’re a delicious incentive. I travel a lot, would it be possible to make these into bars? Do you think they would stay together and last a few days out of the freezer? Can these be put in the freezer and thawed or does it make it gross? Thanks! I’m not sure there’s almond butter in my local store. What should I use to replace it?